This cute moose wreath can be for a door at Christmas or a wall decoration for a rustic look anytime. This guide contains instructions for making a simple moose wreath craft. I wanted to make a more natural seasonal wreath with things I had on hand. There a many variations that could come of this project with various wreaths and stuffed animals. Hang the wreath on a wall or door at about shoulder level. 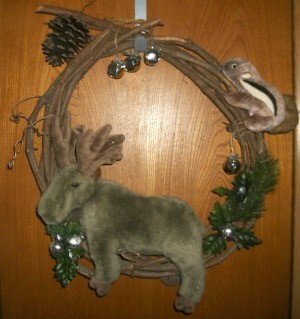 Place moose on the bottom of the wreath or a little to the left, just make sure it balances on the wreath well. Glue at any point where it touches wreath. Then place chipmunk pointing up (on left or right side, your choice where it balances). Glue wherever it touches wreath. Place pine cone(s), mostly on the opposite side from the chipmunk. Glue in place. Glue greenery to fill in gaps. I put the jingle bells at the top so they would jingle more easily and added the others to fill in a little bit. I collect moose so you have my vote! !